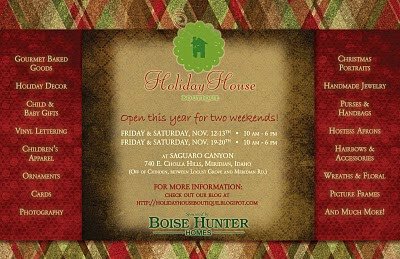 Holiday House Boutique: It's Almost time for the 5th Annual Holiday House Boutique! It's Almost time for the 5th Annual Holiday House Boutique! at 740 E. Cholla Hills, Meridian, Idaho. If you're looking for unique, locally-handcrafted items, this is the place to find them! And we want to welcome back Fleurish Photography to our family of vendors this year. 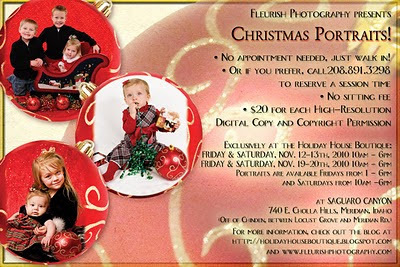 Fleurish will be setting up a studio within the boutique to offer unique Christmas portraits—you provide the kids, she provides the magic! So mark your calendars, and tell your friends, this is one holiday event you won't want to miss! Thanks "Vintage Black"! Make sure you leave a comment of the Fabulessly Frugal post, so you will be officially entered to win! I am now a fan and follower!!yeah! Fun, fun, you guys are amazing!